Once reaching the Cape they suffered from contagious diseases; smallpox, dysentery, measles, and infectious diseases. The ship Joanna Cathaerina in 1673 brought 221 slaves and within fourteen months 129 slaves had died. The ship Voorhout brought 257 slaves, mainly children in 1676 and within three and a half months 92 were dead. Relying solely on the primary data provided in J.G. le Roux’s Hugenote bloed in ons, one can get a partial idea of mortality between 1688 and 1700. In that twelve-year period, a total of 86 refugees died, meaning that as many as 79 may have lived on (48 refugees had no death-dates listed). A cursory gleaning of the wills left by Huguenot men before 1700, indicates that the death-rate among the newer arrivals was high. About ten per cent of them left probated wills and this number gives an indication of deaths in the first decade there. Surely the death-rate was higher. Only those who were able to write a will, or had access to materials on which to write it, with witnesses available, did so. Yellow Fever epidemics caused considerable loss of life for the refugees. Yellow Fever was one of the many diseases that killed many people in the 1700s. Death from Yellow Fever was common because no cure was available. The symptoms start with headaches, chills, and a general ache in back, arms, and legs. This is followed by a high fever for about 3 days, after which the fever goes away, but only for a couple of hours. The high fever then returns and as red blood cells are destroyed the skin and eyes turn yellow. The patient then begins to vomits black blood because of bleeding in the nose, gums, and intestines. As the person's pulse grows weak they start to become confused and delirious. Also, tiny red bumps may appear on the skin. Death follows shortly after. Gout troubled the adults and Kolbe believed the condition derived from excessive consumption of alcohol. Another source agreed, noting that gout generally attacked those aged persons who “have spent most of their lives in ease, voluptuousness, high living, and too free use of wine and other spirituous liquors”. “Putrid fevers” (probably typhoid) also afflicted the refugees. At the Cape, epidemics also took their toll. When smallpox broke out in Cape Town in 1713, the epidemic followed two years of drought. Just as the much-needed rains started falling, the colony had to deal with this epidemic that was introduced via the linens on a ship. Smallpox was especially hard on the Khoi, who had no natural immunity, but it also had a severe impact on the Europeans. The Huguenots were mostly located in the Drakenstein, at Franschhoek, around Stellenbosch, and a few had moved into Wagonmakers Valley by that time. Too many people were dying in the outlying districts and were not able to seek out a notary to make wills. As a result, there is very little data regarding the deaths of Huguenots – both women and men. Surely Anne Fouché and Elizabeth Joubert succumbed to smallpox as their wills were probated in 1713. The “pokkies” claimed at least 1 585 Europeans that year. J.A. Heese found that of these, 875 were children. One report to the Netherlands in June 1713 noted that there were not “20 healthy people in Drakenstein”. Interestingly, Marie Grillion makes the point that her husband, Gideon Malherbe, died of natural causes, yet when the distraught widow and mother was forced to make an accounting of their holdings that, in turn, revealed that her husband and three of her children had died due to smallpox. Other afflictions troubled the Huguenots at the Cape - anxious mothers had to deal with sore eyes – a “distemper” that was worse in summer months. While old people suffered from “a scalding rheum that issued abundantly from the eyes”, the “greatest rate falls on the children”, and thus efforts were made to keep them out of the rays of the sun. One of the Huguenot surgeons treated these eye conditions with drops and “Spanish fly”. Kolbe added soreness of the throat to the list of chronic illnesses. Worms afflicted them too, especially the children. Intestinal parasites were common in that era. In London, the Spitalfields Project involved the excavation and examination of primarily French Huguenot skeletons that had been buried from 1729 to the mid-nineteenth century. Between eight hundred and a thousand bodies were exhumed, with about half of them examined. Among the findings was a high incidence of infant mortality, which the examiners attributed to intestinal worms. 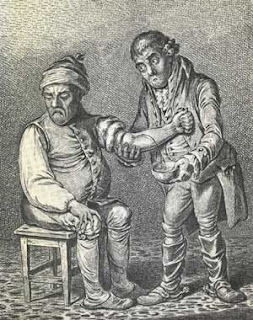 Traveller and physician Anders Sparrman referred to worms as a “troublesome disorder in rural areas”. Another traveller wrote about “dirty scabby children” whose condition he thought was caused by intestinal worms. Certainly intestinal worms contributed to anaemia, but probably were not directly responsible for the deaths that the medical examiners in the Spitalfields Project noted in their study. Another source of illness was rotten teeth. Dental caries and gum diseases were problems in eighteenth-century Europe, where there were some rudimentary forms of treatment available. At this time it was commonly believed that dental caries were caused by worms in the teeth that had to be dislodged “by compounds of myrrh and aloes”. Periodontal diseases were not being diagnosed at that time and one can only infer that such agonies as infection and abscess had to run their course until the teeth simply fell out. In discussing epidemics and diseases, treatments and the persons responsible for administering them, have barely been mentioned. Clearly, when a doctor, whatever his limits of training, was available in these first decades on the frontier, the Huguenots availed themselves of him. As has been seen, Gideon le Grand treated the refugees at the Cape. Despite the role of the ruling hand of the patriarch in others areas of their lives, it was primarily the women who treated their own illnesses and those of their children. Men were probably responsible for gleaning knowledge of local herbs, roots and plants from “others” that were long resident in specific areas. The Khoi had their own treatments for various ailments that plagued them – as had been witnessed by observers such as Laguat at the Cape. At the Cape at least one Huguenot had some background as an apothecary. Isaac Taillefert’s father had been an apothecary in France, as was one of his brothers. While he is often listed as an apothecary, Taillefert’s skills were those of a hat-maker. He was also a farmer, and it is likely that he drew on memories of herbal medications from his father’s pharmacy. In 1698 a French Huguenot traveller remarked on his garden “[It] may very well pass for fine. Nothing, I think, there is wanting”. In fact few medications as we know them, were available. For purposes of treatment, most people made do with herbs, roots, leaves, and even fruits and vegetables. This period in Early Modern European medical history was influenced by the humoral theory posited by Galen, with medical treatment predicated on balancing the humors. The primary means of achieving this aim were through laxatives, emetics, and bleeding – with the occasional blister applied to relieve “pressure” on an affected area of the body. Usually every household was provided with a “Huis Apotheek”, or a box of Halle Medicines which was in much repute here. So great was the faith in these remedies that only in extreme cases was the aid of a physician sought. Even when his services were required the distance that he lived was so great that the patient would probably have succumbed before his arrival if home remedies were not tried. The wife, or one of the elderly matrons, was generally well acquainted with the use of the medicines and from them help was looked for. This threw the country people upon their own resources, and they learnt not only the use of the homeopathic medicines but also the medicinal properties of many of the indigenous plants and herbs. Three types of African wood sorrel were employed to treat scurvy, while garden garlic had a multitude of uses. A physician and a European resident both discounted rhinoceros horn. Still, “the fine shavings were taken internally” and were thought by the locals to cure convulsions and spasms in children. Women in the country brewed a local bush tea (Bobonia cordata) as cure for various internal ailments. They learned to do this from the Khoi or San, while the San also taught them to turn to rooibos tea that had medical properties when taken internally or when ground leaves and bark were applied externally. Several of the first aid remedies used for restoratives were the same as in Holland. Vinegar or lavender water was rubbed on the temples of the patient who was made to inhale the smell of it, and was given to drink hartshorn in a little wine. The colonists had learnt from the Hottentots the use of many of the herbs; these were given as purgatives, emetics, cathartics and diuretics. A plant most commonly used was the buchu. When preserved in brandy it was good for stomachic complaints, and when in vinegar, as an embrocation in rheumatic pains or for sprains and contusions. The Hottentots placed great faith in the use of Buchu Asyn (Buchu Vinegar) as a wash to cleanse and heal a wound. This antiseptic was made by putting the leaves of the buchu into a bottle of cold vinegar and allowing them to steep. The longer they were left to infuse the more efficacious the vinegar became. In sandy tracts of the Colony where the Hottentots fig, Mesembryanthemum Acin Acforme Lin, was found, few other plants were so common in domestic use as this. The juice from the succulent leaves was taken internally to check dysentery and acted as a mild diuretic, it was used as a gargle for malignant sore thr at or in the form of a lotion in burns and scalds. An old Hottentot remedy was the use of the Davidsworteltje which in the form of a decoction acted simultaneously as an emetic, cathartic and diuretic, and the tincture or infusion of the root in wine or brandy was a powerful emetic and purgative. The tops of branches of the rhenosterboschjes, which covered immense tracts of land in the western districts, when infused in wine or brandy gave a good stomachic bitters and was frequently used as a tonic m dyspepsia. The “Boschjes-stroop” made from the sugar bush was considered a good cure for a cough or pulmonary affections. Some believed in cures from the blood, the urine, the excrement, the fat, the skin and flesh of animals. Though it might seem incredible there are country places today where the people have faith in this. Goat fat was used for chest complaints, the excrement of the goat infused was given to a patient to bring out measles. In case of inflammation the patient was wrapped up in the warm skin of a sheep immediately after it was killed. In various parts of the country there were mineral hot springs which had different healing properties; these were visited by people suffering from a variety of illnesses. Many of these waters are today much sought after. James Gillray, published by H. Humphrey, St James's Street, London, January 28, 1804.